The bigs still aren't sure what to make of the Fuzzy Kittens, but Scooter has been accepted as part of the family - grudgingly by Sharae, but welcomed by Uncle John. 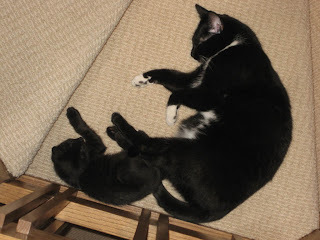 One of John's favorite sleeping places is the bend in the stairs, where he can curl up on the wide end of the triangle and still allow traffic to get by. It's Tummy Tuesday at Lisa Violet's. Finnegan is momentarily awake, with Dicken and Fiona forming sleeping bookends after their fourth (or fifth) meal of the day. Tiny tummies need frequent feedings. The Fancies have figure out the purpose of bowls, but Dicken is still mystified, and will only eat from a syringe. 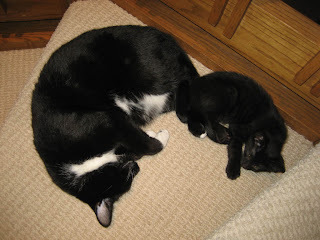 One of the best features of kittens is their near instantaneous acceptance of other kittens. You'd think these were sibs, but not so. Dicken joined the family just yesterday. 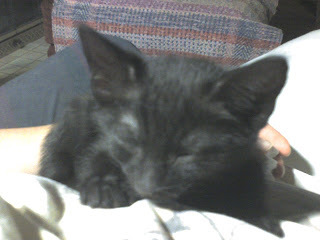 By the way, this is Dicken, the newest addition to my orphan foster troupe. Do you notice anything unusual about him (other than his coyly handsome face)? Does not appear to be eating well. 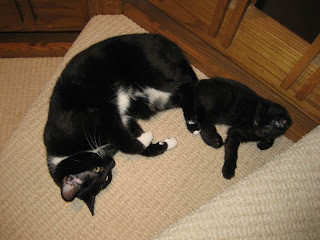 Mom stays up high and kitten can't climb. Syringe feeding - not eating from dish yet. Dicken is eating from the communal plate, but no kibble. 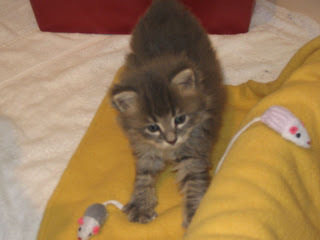 Dolly eats kibble (Baby Cat and Kitten) and is starting to take syringes of KMR + pate. Dicken's wt a little lower, but these were preprandial wts. Eating well dilute pate 4x/day. Dolly still good on kibble and transfered from formula in syringe to plate this am. Splints placed under general and spinal anesthesia. Severe pulmonary complications, whiteout of R lung, ICU support. Dicken euthanized at ~0230 on May 3d. Not eating well, wt gain slow. Resumed adding small amt of KMR powder to diluted kitten pate with good success. Healthy since finished amox, normal stools. 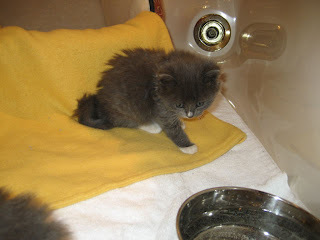 Eating OK (picky); prefers kitten pate with KMR or kibble. Reached 3 lbs today but delaying spay for 1-2 weeks to make sure she has sufficient reserve. The Fancy Pants duo has been with me almost a week, and were starting to get antsy with only the bathroom floor to play in. So today is their first Liberation Day - the Nursery door is open, and they have an extra 24 square feet in the entry way. It's a big day for Scooter, too. 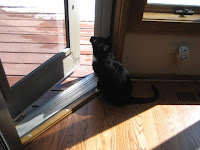 For several days he has been sitting outside the door trying to play with the ball rolling on the other side. I had let him in for short visits, but unfortunately the big cats have trained him well. 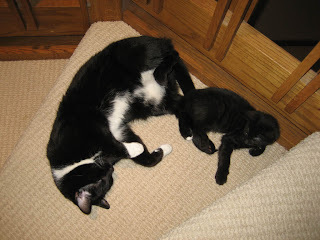 Seems the proper way to great other cats is to bop them. That wasn't too bad, but his wrestling was a tad too aggressive for the little ones, so he couldn't stay. Today, Scooter is in heaven. It is so much more fun to chase and wrestle with a little fluff ball who is close to your own size than with a disgruntled Big who at any moment might really whap you. He's still a little stronger than Fiona and Finnegan, but they are holding their own. Looks like they worked up an appetite - they just ran to their food bowls to finish breakfast, and believe it or not, Scooter is politely waiting for them to finish. Done. Time to play some more. A friend told me that here in the Frozen Tundra of the North they have a name for the day when the ice melts on the lake, pond, or river. Unfortunately, I can't remember what it was... Ice Out, or maybe Ice In. In any case, although it snowed just last weekend, the ice on the pond behind my house was halfway gone on Tuesday, and finished melting yesterday. 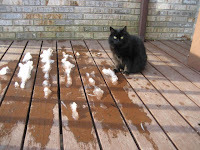 So April 16th is my own personal Ice Out (or Ice In, or whatever) Day for 2008. I was thinking this morning, lying in bed, half awake, that it is interesting how similar the minuets in the first two Bach Suites are, and how completely different. No, maybe not different. Opposite. For instance, the Minuets in Suite 1 were the first dances I learned, being relatively accessible. In Suite 2, they are the last, and thanks to the chords in Minuet I comprise the most difficult music I have played to date. In Suite I, the Minuets are major, then minor. In Suite II, minor then major. The predominant three note motif, a dancy, rising arpeggio, begins Minuet I in Suite 1, and is buried later in Minuet II in Suite 2. Anyway, I decided to spend part of my practice time yesterday afternoon recording my current progress on the first Minuet in Suite 2. Though far from ready for performance (this is actually take 3 of 4), I am really quite pleased with my progress. Progress, heck. Two months ago I couldn't string two chords together. Fiona is not obviously a tabby, but her coat does have an interesting wide ticking that is not obvious because the fur is so long. Here you can see her darling socks in front and stockings in back, quite symmetrical. What you can't see are the little dark spots on the back of each ankle, looking for all the world like she has holes that need darning. 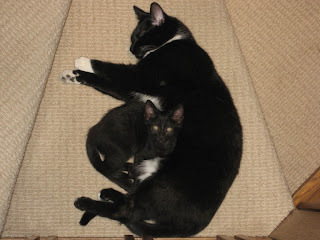 No one will ever believe that these kittens are Formerly Feral. Not only are they not frightened or hissing, but they regularly stop playing to ask for cuddles. I think we have a couple of incipient lap cats here. This is Finnegan. From afar he looks like a simple gray fluff ball, but up close you see he is actually a long-haired blue tabby with a buff undercoat. Aren't those pretty markings around his eyes? Still no word on the other siblings. We got a plea from one of the local foster coordinators this week, looking for more foster homes. Kitten season is starting in earnest, it's still quite cold out, and the system is being additionally stressed by people who are losing their homes and turning their pets over to the shelters. So I'm now out of quarantine, and I took in one of the groups needing placement. Hopefully, it's only part of a group so far. 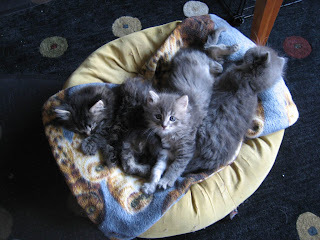 I have two little mostly gray fluff balls born to a feral mom in a warehouse area 4 to 5 weeks ago. The folks at the warehouse were working with one of our rescuers to decide when the optimal time to trap the kittens would be. Ideally, they should be old enough to start weaning, but not so old that they run well. 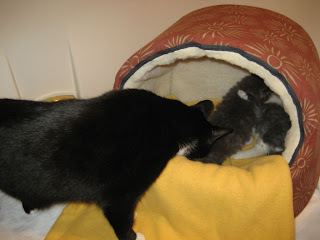 It's a tough balance, because you want them to have maternal care and antibodies in maternal milk and to be properly socialized in their feline family, but you also want them to be young enough to socialize well with humans, which they won't be if they stay with their feral Momma too long. 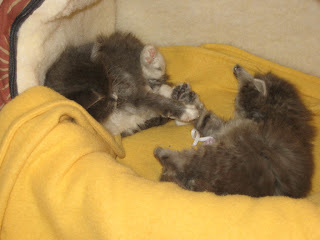 These are two of five, but the rescuer hopes to catch the other three and also Mom for spaying. Reportedly they were a bit hissy last night, but today they act as though they've been handled since birth. They haven't quite got the idea of lapping out of a dish, but they take syringe feedings well and the boy has tried a little Baby Cat kibble. As far as naming, I've decided to go with the Formerly Feral Fluffy Fancy Pants theme, so these first two are now Finnegan and Fiona. 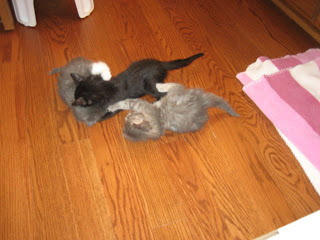 Here's a little wrestling match to celebrate a warm new home. Ha ha! I didn't notice the shadow until I watched the movie here on the blog. Guess who that was! Yup, Uncle John. He's soooo happy to have babies in the Nursery again. I had to let him have a quick visit, but now he has to stay out until the kittens have been vetted and given a clean bill of health. 4/11 trapped, stayed with V- overnight. After another close look, Fiona appears to be a male, and is renamed Fergus. Eating both diluted (Nutro, Advantage) and undiluted (Friskies, Evo) pate and a variety of kibbles. 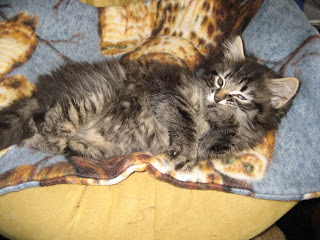 All the kittens and Sharae have diarrhea; Fergus has improved. 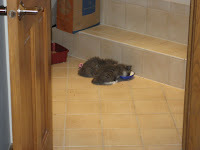 Fergus still has mixed watery diarrhea and normal stool, but is eating well and gaining wt. 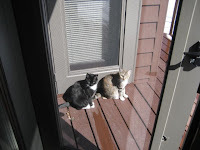 Both recovered from neuter, listed on PetFinder. Fergus has persistent intermittent diarrhea, in spite of several courses of tx for presumed coccidia. Stool exams have been negative for parasites. We are going to try a course of metronidazole for possible bacterial overgrowth, post-inflammatory, non-specific diarrhea. Visited Finnegan (now Sebastian) in his new home. He's doing great. He also had recurrence of diarrhea with stress of move, responding well to dietary limitation (RC Kitten), acidophillus, and homeopathic remedy. 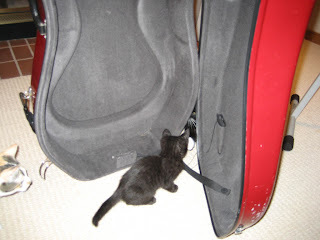 Cello cases are apparently a good place to play, demonstrated here by Scooter and John. When Sharae comes by she displays the typical reaction of my Bigs during Scooter's first day - first interest, then BOP. The younger girls are especially desirous that he know his place in the hierarchy, which is definitely below theirs. Cricket and Madeleine are mostly hands off, and John of course was his lovable Uncle self from the get go. By yesterday afternoon Scooter had discovered the bed, and was curled up there with DH by the time I got home last night. The others tried to boycott, but eventually gave in and joined the sleep-in. As kittens often do, he wanted extra hugs at 4 AM. OK, that may not be my favorite part of having a baby in the house, but he's so awfully darn cute. What do you think? What should we call this little guy? We have a new lodger. He’s 7 or 8 weeks old, and a tiny skinny little bundle of energy. Except when he goes full stop, like here. Pretty much the only time you can grab a picture is when he stops. Somewhere along the way the name “Dude” got attached, but we’re going to have to change that. “Mini” and “Squirt” are filling in for now. The big girls are fairly bemused. A little hissing, a little bopping (so he knows his place), but I saw Sharae playing footsie with him under the couch already. It’s nice to have a baby in the house. That's as much sunshine as I've seen anywhere this week. Sometimes it's hard to remember that the sun is always out there when down here we have one gray day after another. Visited a friend's condo under construction, then went to rehearsal with my old orchestra. 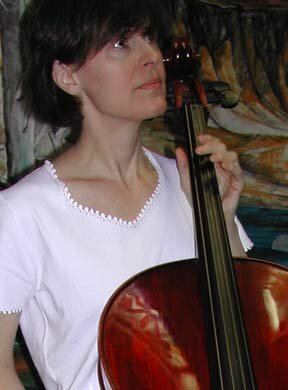 We read most of Schumann's Symphony #2, and it was my first time playing inside, where the viola's usually sit. Good time. Today I threw away my protective mask inserts. It's been a crazy week. 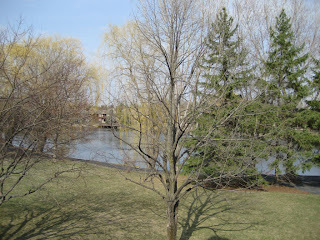 It was a gorgeous weekend, over 40 degrees and sunny. I saw many people running around in T-shirts, but I wore a jacket with my flip-flops. The deck door was finally open, for the first time since... October, maybe? 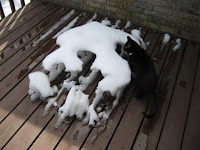 On Saturday we had just a bit of Winter snow left on the deck, forming this interesting snow sculpture that John is investigating. 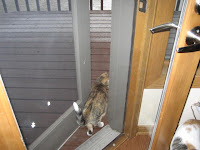 ...enough for Cricket to voluntarily confine herself to the deck, rather than exploring up high. 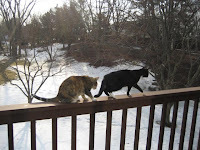 Here she is on the rail, though, showing Seri the ropes. 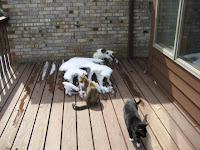 On Sunday, a very little bit of Winter snow sculpture remained, and though you can't see it, the roof is bare. Another great deck day. But on Monday - guess what? 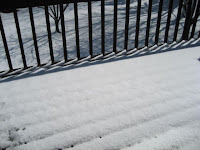 - it snowed again! For 24 hours! 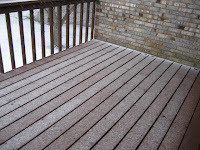 Here is my lovely deck, sans snow sculpture but with the first of its new coat of Spring snow. ...even though the rest of the deck looks like this. And John is at the door, praying "Snow, snow, go away. Isn't it time for April showers?"